Hello, Ladies here is what I have come up with. I have tons of pictures that I took of the kids but I really wanted to use these. 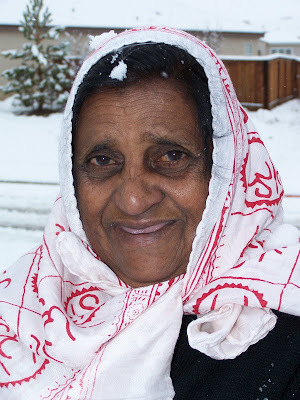 This is a picture of my mother. She lives in South Africa. She was born and raised there. I am fifth generation Indian yet neither my mom or I have travelled to India. My mother has been to America several times to visit me and the kids. She is the strongest woman I have ever known. I really did not have much appreciation of her as a kid as most kid's don't. Today I see her for the greatest mom she was and still is. She is a pure joy to have in my life and there is not a day that goes by that I feel as thought I have abandoned her. I am the black sheep in the family. I have broken every Indian tradition there is. I eat beef, pork and do not follow my culture. I feel guilty yes but I still believe. Isn't that what should count ? On my first trip to the U.S the last words I heard before I got on the plane was " Don't go find a white boy " That would be crossing the boundaries in more ways than one. I grew up with apartheid but not a racist. To do what I did would break the Indian tradition and hurt the elders. Well I did just that. I followed my heart and hoped for the best. Luckily for me the wounds were able to heal for my family.Not only did I meet an American and fall in love with him. He is blonde, blue eyes and Catholic. We married in the catholic church after two years of dating. I kept it a secret the whole time. I never told of the relationship until a year after we were married. All hell broke loose and there were some rough patches. Well long story short all is well now. We got married over again in South Africa the Indian way. ( My life could be a hit Hollywood movie , it really could. This is a very abbreviated version ) My mom grew up with a step mother and worked in the sugar cane fields. She had an extremely hard life. She cannot read or write but can speak 5 different languages. She travelled on a plane half way across the world and has switched planes in major airports without being able to read. ( That is incredible as you know it is a scary thing even when you can read ) She sewed all my clothes when I was a kid as we did not have very much money. Back then fabric was not so expensive. She has travelled half way across the world many times now. She has opened her mind to many things. I am so proud that she tried other types of food like pizza, Chinese food and roasted chicken and turkey. She always eats Indian curries 3 times a day and when she visits me in the U.S she tries her best to fit in. She is even outside in the dead of winter playing in the snow with the kids. There is no snow in Africa. Hot ! hot ! hot ! there. If there ever was a person that never complained it is my mother. The strongest woman I know and love to pieces. She has suffered many losses starting with my dad when I was just four years old. She then lost two of my brothers that had Muscular Dystrophy. If you look at her face you can almost see her story. There is a hidden sadness and pain that nobody should feel. Also you will notice that she has no make up on. On my picture you will see a red dot on my forehead. That symbolizes marriage. A maiden would wear a black dot and it changes to red once you are married. My mother is a widow and has been that way for almost 3o years. She still pines away for her children and the dad I never knew. Everything I am today is because of my mother. Mom , I love you ! I hope you like the portrait. it's amazing just how resilient mums are! Great photo! Beautiful photos of a remarkable woman!! I love the photos and the story behind it too! Thank you for teaching me about a different culture today, it was very interesting. I learned something new!! I don't call myself the black sheep of the family but the one who likes adventures!! 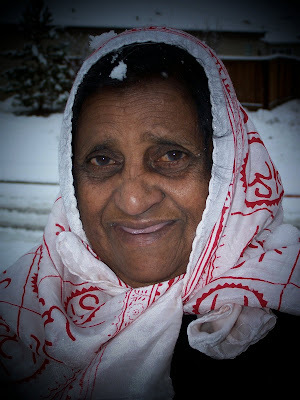 Thank you for a wonderful blog post and sharing fantastic photos of your Mother. What a wonderful story to go with a beautiful picture! I'm quite certain you have made your mom very proud! Great job! oh. This story touched my heart, but It wasn't until I saw the black and white photo of your Mother, that I was brought to tears. Your right. There is so much on her face and in her eyes. She is beautiful. Your life story!! wow. Never feel guilty. You are loving and kind and thoughtful. And you love your children!!!! YOur family is fortunate to have you. It's so good your mother is able to comeout and see you and is so open to things you do and love. How wonderful. she has sucha big heart. I would so love to meet her!!!! Wonderful Job. You've captured this challenge completely. A portrait filled with who that person is!!!!!! Reading your story was pretty poignant for me...considering I am a white girl married to an Indian man. Your mom displays strength and a hard life. Incredible story, incredible woman and incredible photo. You've really captured the person she is in your photo. was quite moved, reading about your mother. wow what a moving story. Your mother is beautiful and inspirational. The pictures are fantastic.Well done! I loved your story and how much she means to you. Great picture of her. WOW!!!!! Loved your entry and the picture is beautiful!!!!! WONDERFUL job..thanks for sharing!!!! Wonderful photos of your mother Free Spirit. I bet actually living in the snow was a real shock to her system coming from Sth Africa -and yours too for that matter! I've just been posting photos on my blog on my holiday in Australia where we had a long weekend in the snow, my first! I loved it but only for 4 days, couldn't live in a place where it snowed I'm afraid, I like the heat. Yes the audio book Holy Cow had a great reader who does all the accents for the various races in the book and she does them so well, must be an actress. I think it really adds so much interest to the audio books to get the different accents. But obviously they have come across well in the written book too, I didn't think they would, it's amazing how much better listening to a book is than reading it, especially the traven/non-fiction sort I like. Yes, I guess you have an American accent now with a little bit of British & Sth African thrown in. My daughter who has lived in Australia, England, America & now Macau in China has picked up little bits from every country over the years she's been travelling (more than 20) so she has a very eclectic accent including of course her native kiwi! I'm sure you'll be able to find all sorts of childrens' audio books too, why not have a look next time you're in the library. You might even get them to go to sleep listening to them when you put them to bed. You can also get the short childrens stories (that we used to listen to on the radio children's hour every Sunday morning many many years ago!) on tape or CD, my granddaughters used to love putting them on when they went to bed. Talking about bed, I must go myself, I have a book to listen to LOL. You don't need to approve this comment if you think it's too long. These pictures of your mother are wonderful and so is the story you've shared with us here!! Families are amazing things, aren't they? Thank you for taking the time to educate us about a culture that most of us knew very little about! !